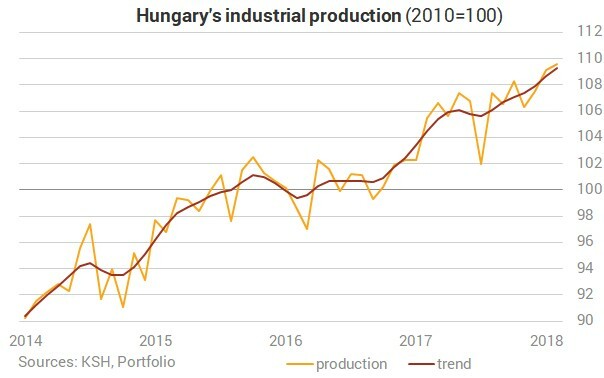 The volume of Hungary’s industrial production grew by 0.5% month on month in February 2018, the Central Statistical Office (KSH) reported on Thursday. The sector managed to expand further after two months of robust performance, confirming that strong economic activity is tantamount to a favourable growth outlook. The data matches the preliminary figure published last week, but today’s detailed data also reveal that the engine of growth is not vehicle manufacturing that has a dominant weight in the index. The IP trend is definitely pointing up, as the sector’s performance improved after a weaker second half in 2017. 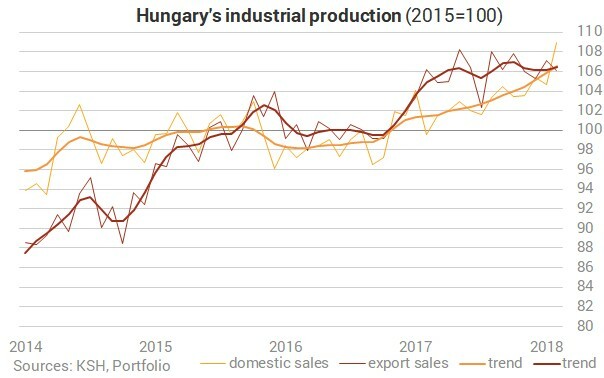 What’s interesting is that domestic sales have been rising faster lately than exports and that is a rare thing in the Hungarian industry. Of course, most likely explanation for the phenomeno0n is the domestic sales of companies supplying for exports. The detailed figures also reveal that the key driver of IP growth is mainly the sectors representing a medium weight in the headline index. Out of the subsections the manufacture of rubber and plastics products, and other non-metallic mineral products rose at the highest rate of 18.8%, the manufacture of basic metals and fabricated metal products also grew considerably, by 15.3%, due to increases in domestic and export demand in both cases. The growth continued in manufacture of chemicals and chemical products (+10% yr/yr) a sector that tends to perform hectically. 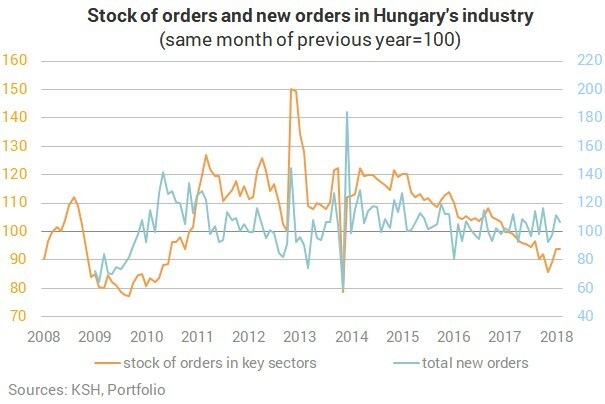 Total new orders volume in the observed subsections of manufacturing increased by 6.4% compared to the same month of 2017. New domestic orders volume grew by 8.0%, while new export orders rose by 6.2%. This has somewhat mitigated the contradiction between the invigoration of industrial production and feeble orders data. It did not disappear, though, as even though new orders picked up the volume of total stock of orders was below the level of February 2017 by 6.3%.